Shifter shaft thrust pin & spring kit. 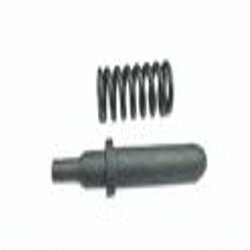 We are one of the renowned companies to offer standard Shafts King Pin to our numerous customers. Our prolific marketing team has invested time and efforts to procure superior quality raw material to design this Shafts King Pin. We have a huge warehousing unit to store this range with utmost care and safety. Backed by rich industry experience and market understanding, we are involved in offering a wide array of Stainless Steel Shaft Pin to our valued patrons. We are offering wide range of shaft pins to our clients, these shaft pins help in effectively providing connection to all types of transmission equipment and enabling transmission of both torque & axial thrust loads. Our precision pins and shafts have multiple uses for automotive, aerospace and general industrial applications. These custom-engineered products are used as motor and gear shafts, fasteners and rollers. They also serve critical functions in fuel injectors and antilock braking systems. We are one of the trusted companies of JCB Shaft Pin. Our products are enormously admired in the market owing to their top features. Owing to devoted experts, we have been competent to present a wide range of Shaft Pin. >Our precision pins and shafts have multiple uses for automotive, aerospace and general industrial applications.